When I was five years old, I was assigned the part of the businessman in “The Little Prince.” I sat in a chair in the middle of the makeshift stage, practically swallowed whole by my father’s blazer and a hat that had to be pushed as far back as possible to keep it from completely covering my eyes. I don’t recall there being anything inherently humorous about the constant counting the businessman character did; so it must have been my appearance in my daddy’s clothes that brought me laughs so rich and warm that I never wanted to leave that chair. I fell in love with the dramatic arts that evening four decades ago, and I’ve been hooked ever since. 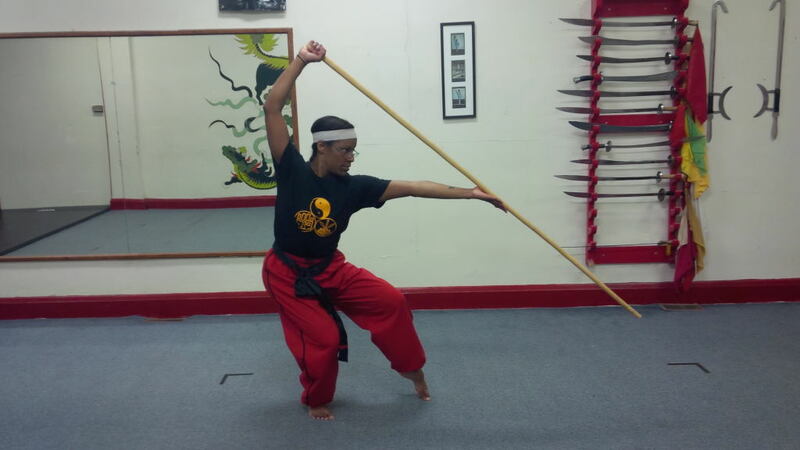 Sweating it out at the guan tonight, practicing the long staff form as best I could with a hampered wing, the lack of power on my right side was obvious. To make matters worse, I repeatedly made silly mistakes, based on misjudging distances that I should know like the back of my hand by now. At one point, I slid my hand so far down the staff, I was no longer holding it. On another repetition, I scraped the floor with it, which is never supposed to happen. As the training wore on, I felt shadowed by younger versions of my theater-loving self: the junior high school student in tap shoes, the sixteen-year-old lead in the spring musical, the seventeen-year-old salaried wardrobe supervisor in a union dinner theater. What they all had in common was the repeated experience of dress rehearsals littered with faulty props, forgotten song verses, follow lights that were too slow and entrances that were too soon. The majority of productions I worked in or on had bad dress rehearsals. But as any stage rat will tell you, a bad dress rehearsal, in theater superstition, meant the cast would likely have a good show. With Saturday morning just two and half days away, tonight was a pretty bad dress rehearsal in my martial arts life. I could use Thursday to iron out every nuance that I think still needs it, but my younger selves are telling me not to. They’re telling me to trust that tonight foreshadows a good show. They’re telling me to trust myself. My right arm feels like it’s going to fall from my shoulder at any minute now. Something inside it has been pulled or sprained for months, but when I first felt it back in October, I thought it was something minor that would repair itself, as most of my bumps and bruises that aren’t knee related all have. But time for wishful thinking has come and gone. The reality is that every time I practice this form that’s been the center of my kung fu training for a year, I’m exacerbating whatever is wrong with my arm. I know I’m going to have to lay off the long staff form for my arm to appreciably repair itself (notice that I’m assuming it can do that), but that can’t happen this week. Saturday is a final black sash test for a former sparring partner and all around great guy, and I was told a month ago that I’m doing the long staff form during black sash demonstrations at the break for his test. I’ve declined to do a demo too many times to be let out of it again without my arm being in a sling. Additionally, Sifu’s told me that this demo is a test for me. He’ll be grading my performance. So I don’t have the option of performing badly this Saturday. I don’t have the luxury to be injured. All of this made tonight’s training frustrating. Ironically, that emotion seemed to serve me well. Two family members volunteered, on different repetitions, that my form looked good. That’s not something they generally say without me asking how I’m doing; so I have to assume it was even better than usual. Perhaps leaving it all on the floor, in an effort to see just how far I could push it with a weak arm, was exactly what I needed. It reminded me of something I hadn’t thought about since my own black sash testing shortly after a fifth knee surgery: hurt doesn’t have to mean mediocre. It just means working harder than I think the injury will allow to be sure that all my practice shows, even if a hit or two isn’t as hard as it should be. Sunday was one of those days that needed about six more hours in it for me to finish all that I needed to do. After the cooking, the house care, the hard drive clean out, the download of the latest video shot for work, the logging of that video, the bill paying and the balancing of the checkbook, there was no time for meaningful stretching, much less a little Pa Chi practice or watching the Sing Yi tutorial video that my boy emailed to me. Sunday is usually the one guaranteed break from kung fu, the rejuvenation day; but I like it much better when that’s by choice rather than dictated by other priorities. I had actually planned on getting a little kicking combination practice in, and it didn’t happen. Maybe it was just the powers of the universe doing for me what I couldn’t do for myself: relieving the pressure on an often kung-fu-performance-obsessed brain and filling it with other items of life that are almost as challenging. With a tough week and month ahead of training necessities that can’t easily be met, maybe I did it to myself for distraction. There were only two items on Sunday’s to-do list that aren’t normally on every Sunday’s list. They turned out to be more time-consuming than I anticipated, but still, I’m pretty good at multitasking. It usually comes at the expense of sleep, but getting a ton accomplished in a day is pretty typical. So I have to conclude that the part of me that knew I needed a break was stronger than the part that usually thinks a break is a waste of time. Sometimes you just have to say thank you to whatever it is that makes you take care of yourself when you weren’t intending to. To the powers of the universe, thank you. The sensation spread out across my face like ripples from a pebble tossed in a pond. I shook my head back and forth instinctively, hoping not to feel liquid land anywhere as a result. I kept moving toward him slowly, with hands lowered to chest level – an inappropriate and incorrect positioning with the match still going. Of course I knew he wouldn’t take advantage of the lowered defenses. If I’d stopped shaking my head, stopped thinking about the sting, I could’ve actually focused on what he was asking me long enough to answer. Am I what? I thought. He sounded worried. He must have asked the question several times while I was shaking my head, lost in the surrealism that always exists when actual pain comes at the hands of one of my children. My fault, I thought. My hands were clearly down. And with that, we were back at it: circling each other; moving in; grappling when too close and about to be cornered; blocking kicks; shelling up against a barrage of punches to the head; catching kicks and holding them just long enough to show the other the error of not retracting faster, and so on. It was the first time in forever that we sparred together in gear with full force. We used to do it regularly, every Saturday, when I was testing for black sash. Getting beat on by my son, who’s fast and who has difficulty controlling his power, was a key element in learning to control my emotions in a match. But somewhere along the line, after the black sash was attained, his lack of control began to anger me. Sometimes I just wanted to work on a few techniques with an opponent, not have an all-out fight. When we couldn’t seem to find the middle ground, I called it quits on fighting my son. But Saturday it occurred spontaneously, with both of us in gear to better train his sister, and it all came back: the annoyance at his greater mobility, the frustration at moves of his that made me worry about my knees, and yes, the fun of having the kid put me back to the test – and holding up just fine. There is no getting used to wincing while getting dressed and knowing that the force of your own child’s foot against your side is the reason. There is no way for me to be guilt-free about sending my son to school with a bruise above his eye that I put there. With that said, there was once a value in this most unnatural activity of physical confrontation between mother and son. It was good to remember that… if just for today. I searched the web Friday for a gym I can rent time to train in when I need to work on my forms and can’t get into the school. And because complaining makes no sense when there’s something one can do to rectify the problem, I actually picked up the phone, too. It turns out there are a few community centers that have gym space for rent. I’m not confined to the steep fees for a mere hour on the hardwood at the countless sports centers. So I’m waiting on a couple of return calls, with fingers crossed that I’ll be a little less at the mercy of others when a recurring misstep needs fixing on the way to the tournament floor. Perhaps I could even start to train others in the extra training space I find…. Steps feel a little lighter when taking them in the right direction. Years of routine makes that easy to forget. I like to assume that anyone can surprise me in kung fu. Perhaps it’s because I surprised myself in making it to black sash that I give the benefit of the doubt to every student in the building, no matter how much they may have struggled in the past with a certain stage of the curriculum. I don’t think that my daughter is getting that benefit of the doubt from some of our instructors. What is the norm for students at her sash level isn’t expected of her, because it’s assumed that her PDD makes her a person that needs more time to learn. That was true when we came to the school, but not anymore – and not for some time. Her issues are social not physical. She’s now a person who needs a push to get it done for almost everything in her life that she considers work, and only her immediate family (and academic teachers) seem to know that. I don’t teach upper sashes yet, but the mother bear in me has been awakened. Quite simply, this means that a Siheng or two is going to need to make an allowance in the instructor rules for me when it comes to my daughter. She deserves a lot more teaching attention than she’s getting, and I don’t plan to keep her waiting any longer. It was the second time in as many classes that the instructor for the green sashes couldn’t make it in, leaving me to assist with the most advanced group of the beginners’ class. 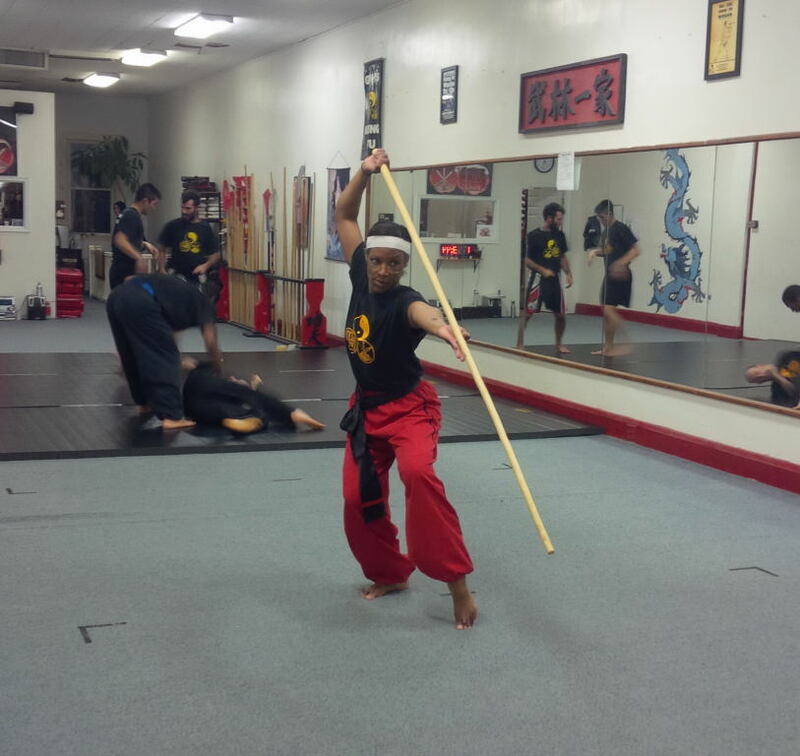 I had a blast on Monday helping to refine parts of the Dragon Fist form for some of my earliest students. It was a bonus to help them with the part of kung fu I like the least but that taught me the most. When I became a green sash and had to start sparring, it was a tough time. I’d come to kung fu for the beauty and agility of the forms, not to beat and be beaten. Getting clobbered by young men (and a few older ones) who’d come to kung fu to learn to fight – and who could move a lot faster than the female in her forties with arthritic, surgically-repaired knees – was something I couldn’t go around if I wanted to advance in the curriculum. And believe me, I tried going around it. Helping the sparring class gave me the opportunity to show others a short cut through potentially rough terrain. “Ohhhh,” was the chorus of realization that came back at me. The next round saw distinct improvement. Mission accomplished. There were a lot of tags to the face along my road to the black sash. Many happened because I could have used the leg check a lot earlier in my training. It’s something I can’t remember being formally taught in a sparring class. I picked it up simply by fighting other black sashes and having them check my kicks. The green sashes tonight got an early introduction. One of the most important ingredients for doing well in a sparring match is the absence of fear. It’s unlikely fear will take a hike if one is getting hurt. So the sooner students learn the simplest tactics for defense when fighting a larger, more experienced opponent, the sooner they’ll have the confidence needed to master the offense. I could be wrong; but that’s how I see it – and it made me happy to pass it on. The first time I did the long staff in competition, I dropped it. I didn’t so much drop it as inadvertently toss it and neglect to catch it, but the effect was the same: “click, clunk, click, click,” was the rattle sound that lasted all of about a second, before I picked up my weapon and soldiered on to a last-place finish in the long weapon event. The sound of my staff against the gym floor had sprung into my thoughts more than once in recent days, even though I haven’t dropped it in any performance since that first public one. It’s almost as if some part of my psyche was attempting to jinx me into repeating one of the worst moments of my martial arts life. So I opted for more practice, arriving almost an hour before the beginners’ class Monday to get in as many repetitions of the staff form as I could before teaching. Sure enough, self-fulfilling prophesies being what they are, the staff left my hand on the spin before the final slam four out of the first six times I did the form. I’m quite certain it would have been more had I not literally been saved by the bell. Fast forward to the end of class and the resumption of repetitions, and I was lulled into believing that whatever glitch had reinstituted itself in my hand work had gone back to whence it came, until I dropped the staff once more, in the same section of the form, while doing the last of my intended repetitions for the evening. That was it. Enough already! I wasn’t about to let my subconscious do a number on me with a problem that hadn’t existed in forever. I had to break it down to figure it out, but I did so in under a minute. It’s a lot easier to hang onto a staff if I wrap my fingers all the way around it. Apparently, my right hand was getting a little lazy with the grip in mid spin. It’s funny how quickly a problem can be solved just by deciding to be finished with it, especially when the problem is an effect of self-sabotage. It’s a lesson easily learned – and just as easily forgotten, if I allow it to be. So I think I’ll keep a grip on the lesson as well. “Not at this time, no,” Sifu said and bolted off across the room to nothing in particular. The hasty departure struck me as a way to shut down any follow-up on my part, to avoid conversation, and therefore, confrontation. I learned a lifetime ago that “no” is a complete sentence. So though his unequivocal rejection of my request to borrow his key on my weekdays off momentarily made my eyes sting, I wasn’t planning on countering with an argument. If I had been, I simply would have gone into the office to talk to him again before leaving. But the thought didn’t cross my mind. I was too busy being angry and hurt. Black sash teachers at the school don’t have to pay monthly fees anymore, and they have a key to the building. As an assistant teacher, I don’t qualify for either of these perks. This isn’t written in any martial arts manifesto or even in the school rules and regulations. In fact, the older teachers tell me that the founder of the school handed out keys to black sashes pretty freely. While hitting up Siheng Steve for additional moves of the Pa Chi form, I was completely distracted by thoughts of how unfairly it felt like I was being treated, particularly since I “assist” for at least ten classes a month (all but one full-fledged teacher does eight classes at most). What’s a dedicated kung fu lover and teacher – who’d like to win a tournament event or two this year – have to do to get a little extra practice time and space on the floor? I thought. After wasting a bit more of Siheng Steve’s time, I put the petulant child in my head down for a nap and attempted to survey the landscape with an objective eye. The answer I arrived at pretty quickly was: nothing. There was nothing I could do to get what I need. The space is Sifu’s to manage, and he has his reasons for withholding. Perhaps all spare time must be reserved for our contender for the national team. Perhaps the man just doesn’t want to risk having someone else in the space when he might want to use it. If I were in charge, I’d likely feel the same way. I’ve gotten so much better over the years at accepting what I can’t change or control, but that doesn’t mean I have to like it. For now, I suspect this denial of a small favor may fuel the execution of my forms in an entirely new way. I certainly won’t have any problem with that.